Good one, Prerna, as usual. 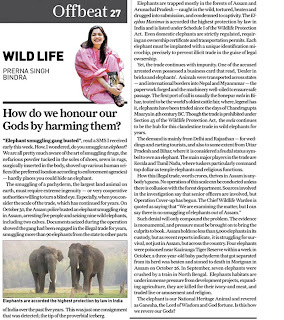 I have been reading a lot about the plight of elephants, and I must say, it is rather obvious now. We regularly visit temples in south India, all of which have elephants. Over the years I have noticed how they are being abused just for a few coins, instead of being worshipped as they used to be. I still remember times when the elephants at least used to look healthy, but now, their condition is so bad, that i really feel sorry for them. Earlier, we used to give bananas to elephants, and the mahout used to ask the elephant to bless us, but this time, he asked us for five rupees for one person, and when the elephant himself lifted his trunk for a second blessing, he got a sharp rap on the trunk, which really irritated me. I shouted at the guy to stop, and had to tell him I would pay more before he allowed the elephant to go! It was really pathetic. We are hypocrates and selfish people in general; it does not sound good but this is a fact one should accept. We pretend to be very religious and believe in rituals but when it comes to practice our act are cunningly selfish. There are a few good examples like Bishnois in Rajasthan who protects blackbucks and Chinkaras but otherwise wildlife is being killed rampently for meat, skins, bones or ivory. One who has doubt can see recent video of an elephant calf in Assam where it was beaten to death in presence of armed police. Prerna Singh Bindra has been at the forefront of the battle to conserve India’s wildlife for over a decade. She was a member of India’s National Board for Wildlife and its core Standing Committee (2010-13).